The history of the Vancouver Street Soccer League is long and complex. Many of the earliest developments have been lost to the sands of time. However, this much is certain: the VSSL began in spirit in mid-2008, when the city’s first Street Soccer team, the Vancouver Dream-Catchers, was formed. The Dream-Catchers eventually dissolved and formed two teams – Portland FC and the Eastside Sun Eagles – but not without the recognition that they were the driving force behind all of Vancouver’s initial Street Soccer efforts. The team’s Board of Directors was led by Michael Cash from Farpost Soccer Goals, and Rhonda Alvarez acted as Executive Director. The Dream-Catchers’ Head Coaches were Vlad Samozvanov and Steve Laleune of the Vancouver Fire Department, with future League President Alan Bates acting as assistant coach. In 2009, Sarah Blyth led the creation of a soccer team made up of residents of the Portland Hotel Society’s New Fountain Shelter. Throughout that year, several volunteers including Zoran Barazanci, Alan Bates, Sarah Blyth, Leo Cooper, Don Crane, Kurt Heinrich, Chris Hellewell, Andrea Reimer, Kailin See, and Fidel Vila-Rodriguez contributed to the creation of the team that is now Portland FC. Around the same time, two more teams sprang into existence: Lotfi Bejaoui – supported by Sandy MacKeigan and the Oppenheimer Park Centre – expanded Oppenheimer Park’s weekly drop-in soccer program into the East Side Sun Eagles. Meanwhile, Charles MacGregor’s longstanding soccer program for at-risk youth at the North Shore Salvation Army spawned the North Shore Shields. These three teams played Vancouver’s first street soccer games. That June, the East Side Sun Eagles travelled to the Street Soccer Canada National Championship in Toronto in a bid to retain their title as champions. This time, they were knocked out in the semi-finals. Around the same time, Leef Evans travelled to Milan as the first Vancouver Street Soccer player to play for Team Canada at the 2009 Homeless World Cup. In early September, a team from the Aboriginal Friendship Center, led by Brian Francis, participated in a Street Soccer Tournament for the first time. During the summer of 2009, Alan Bates led the organization of the UBC Psychiatry Street Soccer Tournament, in which Portland FC, the Eastside SunEagles,and the North Shore Shields, all competed. The tournament took place on the 20th September at UBC’s Student Recreation Centre, and has been a regular and much-anticipated fixture in the VSSL calendar ever since. Shortly after the tournament, the Vancouver Street Soccer League was officially created, with Portland FC, the East Side Sun Eagles, the North Shore Shields, and the Aboriginal Friendship Center as founding teams, and Alan Bates as the inaugural president. That November, the league again took on a team led by the now Mayor of Vancouver, Gregor Robertson. 2010 began with a North Shore tournament, hosted by the North Shore Shields, and the inaugural Going For Gold tournament. The latter witnessed a first tournament win for the Aboriginal Friendship Center team; an entire photo album dedicated to the event can be found here. A month later, Kailin See, Sarah Blyth and Chris Hellewell organized the inaugural Rocker for Street Soccer fundraiser. The event took place on April 15 at the Rickshaw Theatre, featuring local Vancouver bands Mezamazing and Boogie Monster, as well as wrestlers, street performers, and a silent auction. In May, the Eastside Sun Eagles followed suit with a fundraiser at a Bean Around The World. In July of 2010, the VSSL made their inaugural appearance at the Vancouver International Soccer Festival. Three weeks later, following a huge amount of logistical and fundraising efforts, it was confirmed: the Vancouver Street Soccer League would be sending eight players to represent Team Canada at the Homeless World Cup in Rio de Janeiro. These eight players would be co-captains Patrick Oleman and Kevin King, and then players Frank Studdhorse, Jeremy Isaac, Randy Comiso, Peter Chow, Richard Mountain, and Robert Milton. (All of whom continue to regularly train with us.) They crew left in mid-September, and the tournament took place over the space of two weeks. They didn’t claim the championship in Rio, but they had a hell of a time, and brought home arguably an even bigger prize: the Fair Play Award. 2011 witnessed the breaking of new ground for the VSSL: a women’s team. In January, Kailin See and Sarah Blyth spearheaded the creation of Portland Phoenix, Canada’s first all-female Street Soccer team. Shortly afterwards, experienced soccer player and coach Dominique Falls came on as the Phoenix’s head coach. Meanwhile, veteran VSSL player Patrick Oleman separated from Portland FC and formed his own team, Woodwards FC. 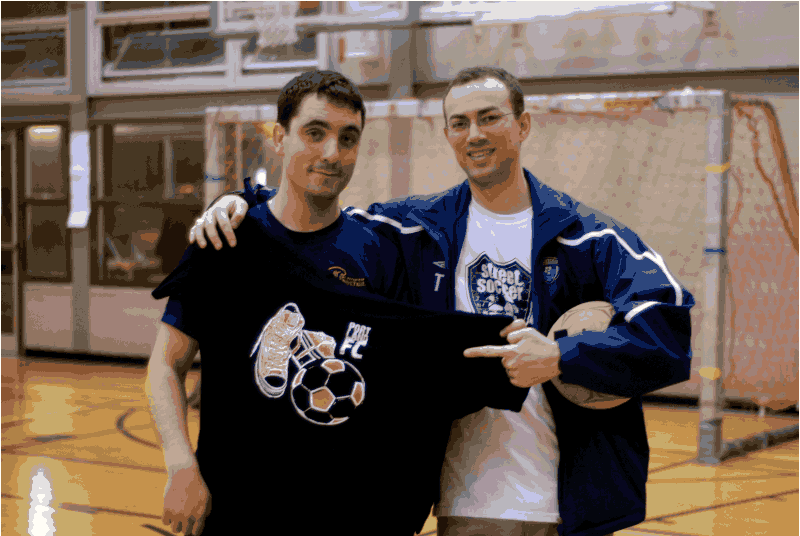 In March, the League participated in the second UBC Psychiatry Street Soccer Tournament. They were joined this time by a new Surrey-based street soccer team, founded by Michael Cash and Shawn Forde. On April 14, the VSSL played a 24-hour game of street soccer in protest at the possible closure of Vancouver’s New Fountain Shelter. (The shelter remains open to this day.) Two months later, they travelled fourteen-hours to Alert Bay, to participate in their first June Sports soccer tournament, hosted by the ‘Namgis First Nation. VSSL’s Team Canada contingent departed less than a week later, for what might just have been their biggest adventure to date. An excellent personal account of the trip, written by VSSL old-hand and team goalkeeper Debbie Krull, is available here. During the latter part of 2011, Maryvon Delanoe – who travelled to Paris as a volunteer – initiated the meal program for healthy food after practices. Meanwhile, Alan Bates, Fidel Vila-Rodriguez, Alasdair Barr, Lurdes Tse, Arun Agha, and Heidi Boyda began academic research into the benefits of the VSSL for players, volunteers, and healthcare trainees. In December, Portland FC and Phoenix FC participated in the NSGSC Indoor Co-Ed Tournament. In January of 2012, a team who have since become one of the mainstays of the League came onboard: Covenant House. (Thanks to his tireless effort and wonderful attitude, the team’s head coach, Steve McMinn, has since risen to the position of League President.) Around the same time, Team Canada striker Virgil Goosehead founded Station Street FC. Virgil’s team made an immediate impact, winning a BC-wide tournament in Kelowna. During the summer of 2012, the League continued to go from strength to strength. In July, League President Alan Bates was awarded the Vancouver Whitecaps Major League Soccer W.O.R.K.S. Community MVP Award and the Queen Elizabeth II Diamond Jubilee Medal, in recognition of what VSSL players and volunteers had accomplished over the first three years of the league. Around the same time, Christina Harzan was hired as the VSSL’s Director (and first employee), and obtained official society status for League. Sarah Blyth, meanwhile, was awarded the In Her Footsteps Award by the BC Sports Hall of Fame for promoting women’s participation in sport. And in June, ex-Canada national team player and current UBC med student Sari Raber created the monthly UBC Medicine Vs. Vancouver Street Soccer series; a battle which continues to rage to this day. In the summer – this time in slightly more of a backseat role – the VSSL contributed four players to Team Canada for the 2012 Homeless World Cup in Mexico City. Fabian Ulloa, Rahul Kumar, Natasha Fox and Krista Nickason left Vancouver on October 4, and once more did the league proud. During the second half of 2012, the exciting developments continued. In what was a natural evolution of their longstanding relationship with the League, the Vancouver Southsiders – the Whitecaps official supporters group, and the largest supporters group in Canada – became official supporters of the VSSL. Social Conscience Fair Trade Sports Balls became the official soccer ball sponsor of the VSSL, and NDG Financial contributed funds for equipment and uniforms. In November, two experienced soccer players, Ryan Semião and Matt Owen, joined the league as coaches. A month later, Portland FC and Phoenix FC participated once again in the NSGSC Indoor Co-Ed Tournament. In early 2013, following Alan Bates’ departure for a fellowship at the Memorial Sloan-Kettering Cancer Center in New York City, Covenant House Head Coach Steve McMinn became President of the VSSL, and a Board was elected to lead the new official society. At the very same meeting, Fairware expanded their longtime support of the VSSL by becoming the official uniform sponsor. During the early part of the year, thanks to the initiative of their new head coach, Andrea Neil, the UBC Women’s Varsity team became an official supporter of the VSSL. A number of the Thunderbirds joined VSSL players in a North Van tournament in mid-April. That same month, the League received a generous grant from ViaSport, allowing us to replenish our equipment, and send a number of players and volunteers on refereeing and coaching courses. Two weeks after their return, the League’s players headed off to Lewis Park, Courtenay, for the Western Canadian selection tournament for the Homeless World Cup, 2013. Later in the summer, it was confirmed that two players from the Covenant House team – Dennis and Taran – would be participating in the tournament in Poznan, Poland. Following a month’s hard training, a final match-up against the UBC Med team, and a send-off meal at the Spaghetti Factory in Vancouver’s Gastown, the players hit the road. Once again, for the fourth year running, VSSL would be flying the flag at the Homeless World Cup. For the Vancouver Street Soccer League, then, the adventures continue. To keep up to speed with our most recent developments, check out our Instagram page.